The Basha-Mesa High boys basketball semifinal turned out to be the defensive struggle everyone anticipated. So who got the better of it? No. 2 Mesa when it counted. The Jackrabbits were strongest in the second and fourth quarters Friday night and posted a 50-35 victory over No. 3 Basha in a Division I clash at Grand Canyon University. Mesa (25-4) is back in a championship game for the first time since 2004 when it prevailed over Desert Vista. Mesa matches up against No. 8 Sunnyslope, a 46-43 winner over Gilbert, on Monday (Feb. 29) at 8 p.m at Gila River Arena. Basha closed out its season matching its longest postseason run. Basha also reached the semis in 2008, losing to eventual champ Desert Vista. Mesa's defense, led as usual by 6-foot senior guard David Cummard, held Basha to two points in the second period when it pushed a small fisrt-quarter lead to 11 at the break. Basha made a run late in the third period to early in the fourth with a rash of threes from Terrell Brown, Antwan Ross-Jones and Brennan Davis. Mesa's lead was down to 37-33 with 6:10 left. But other than a putback by Devin Kirby with 4:19 left, Basha did not score again. Cummard's contribution in this one didn't stop with his defense. He scored 10 points, led the team in rebounding with seven, assists with three and tied for the best night in steals with three. "David was big tonight," Mesa coach Shane Burcar said. "He made two threes early. We don't want handcuffs on guys. We want them all to be a (offensive) player." Cummard picked up the slack for leading scorer Drew Hatch, who suffered through a tough first half offensively. Drew Hatch netted only three points in the first 16 minutes. He managed to match his brother, sophomore Mark, with a team-high 13 points by game's end. Neither Hatch enjoyed good shooting stats, combiining to shoot 37 percent (10 of 27). Mesa, like Hamilton on the girls side of D-I, has been hurt by the loss of a key player to injury. The Jackrabbits have filled the hole left by a knee injury to Darius Goudeau with DJ Henderson and Joban Green stepping up on different nights. Green scored four points in the game, added five rebounds and made a nifty reverse layup after Basha pulled within 39-35 with under four minutes to play. That started an 11-0 run to finish and clinch the title-game berth. "Joban played 24 minutes the other night and that's the most he's played," Burcar said. "We haven't been able to devleop our bench much with so many tough games and the power-rating games being so important. We've had guys step up." 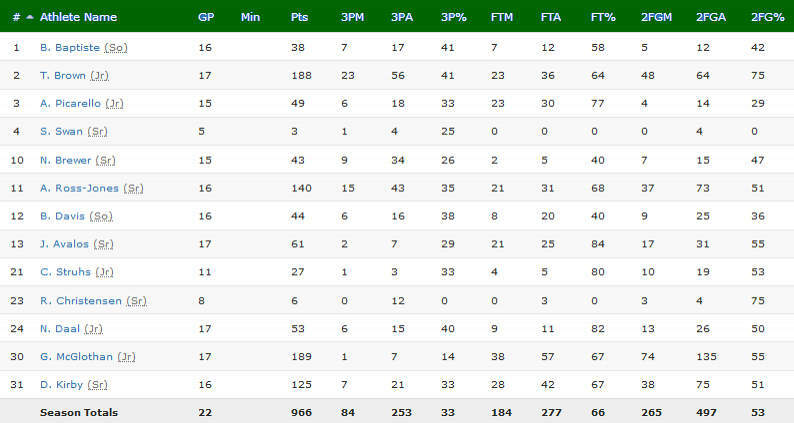 Basha had balanced scoring, but none from its bench. Brown led with 10 points, Ross-Jones had eight and Gabe McGlothan and Devin Kirby chipped in seven apiece. McGlothan led the Bears in rebounding with seven. The third-seeded Bears sent the No. 22 Pioneers packing with a 26-10 edge in the final period to reach the semifinals for the second time in school history. 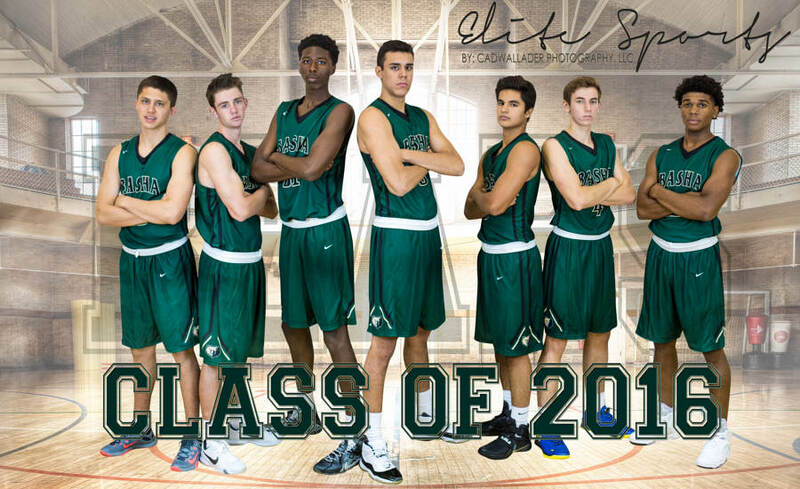 Basha (23-6) plays next on Friday (Feb. 26) at 6:15 p.m. at Grand Canyon University against the Mesa, a 60-53 winner over St. Mary's. Antwan Ross-Jones, Terrell Brown and Devin Kirby paced Basha, combining for 40 points. Ross-Jones had 19 points, Brown 11 and Kirby 10. Basha opened up a double-digit lead for the first time midway through the final quarter after taking a 29-25 lead to the fourth period. A parade to the free-throw line the final three minutes added to the deficit. Basha's only other appearance in a semifinal came in 2008 -- a loss to eventual champ Desert Vista. Freshman Spencer Rattler led Pinnacle with 8 points and senior AJ Elliot had 7 for the Pioneers. Corona del Sol has lost more games this year than it has the previous four -- all championship seasons. But despite its current record of 9-8 the Aztecs aren't being ignored in a bid for a fifth successive crown. They still have folks attention. "Until the state tournament comes and someone is able to beat them there, they are No. 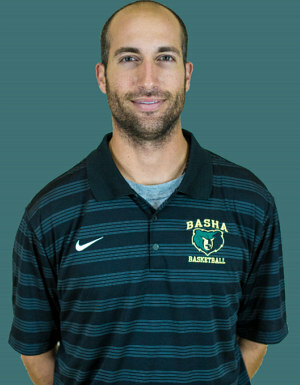 1 no matter what the rankings say," Basha coach Mike Grothaus said Wednesday night after his Bears rally from way back fell short, 62-59, at Corona del Sol. Four of Corona's losses are to high-powered, out-of-state teams who have combined for a 50-3 record. Two of its three Arizona power-ranking losses are to the current No. 1s in D-I (Mesa High) and D-II (Shadow Mountain). The Aztecs record is what it is, but opponents are stoked night-in and night-out to take down the defending champs. Saben Lee and Alex Barcello combined fo make 11 free throws in the fourth quarter enabling Corona to blunt Basha's rally from 18 points down in the third period. Basha led a couple times in the final period, the last time 57-56 with 3:06 to play. Barcello made two free throws with 2:53 left to put Corona (9-8, overall, 8-5 power-ranking games) ahead for good, 58-57. Barcello and Lee each made two free throws in the final 40 seconds to seal the victory. Basha turned the ball over on three possessions in the final three minutes that didn't help -- two traveling calls and a three-second violation. "We are a very competitive team and we will never give up," Grothaus said. "I've come to expect that. In the end it came down to execution and we didn't execute. The things we did weren't what we wanted." Corona coach Neil MacDonald breathed a sigh of relief that his technical foul in the fourth period didn't end up costing the Aztecs. MacDonald's squad bolstered his confidence with their effort given trying circumstances. "We were playing short and with a short lineup, but these guys gutted it out," MacDonald said. "I'm as proud of them as I've been all season." Basha converted all four technical foul free throws it attempted aiding its comeback. Basha (16-4, 9-2) dominated the boards in part because the Aztecs were without starting strong forward Nate Marshall (broken nose) and also didn't have Tyrell Henderson for the final 10 minutes. Henderson picked up his fourth foul and a few seconds later his fifth via a technical late in the third period while Basha was in the process of paring Corona's 42-24 lead. That's when Corona's lineup became very small since Henderson's athleticism allows him to play bigger than his 6-2 frame. Barcello finished with a game-high 21 points, Henderson had 14 points and Lee hit for 12. Lee had a nice game on the defensive end with at least five steals , doing a good job double-teaming behind Basha's post game anchored by strong forward Gabe McGlothan. McGlothan led Basha with 18 points and Antwan Ross-Jones gave the Bears a lift with perimeter shooting off the bench. Ross-Jones tallied 15 points and connected on three threes. Devin Kirby added 11 points, most of them on the offensive glass. He also sank a three. Basha has seen zone defenses pretty much every time out this season. Some have been more effective than others. For a quarter and a little more, Red Mountain had its zone keeping Basha in line. By the end of the second quarter that changed and so did the direction of the contest. Basha received strong play inside and enough perimeter effectiveness at the right time to pull away to a 52-34 win over Red Mountain in a Division I matchup at Red Mountain. Strong forward Gabe McGlothan and shooting guard Terrell Brown propelled Basha to the lead at halftime after Red Mountain controlled the first 12 minutes or so. When 6-foot-9 senior Devin Kirby began asserting himself from the second period forward -- off the bench -- Red Mountain's chances of prevailing diminished. "We've seen enough zone that we are getting pretty good against them," Grothaus said. "We have the ability to adjust and we're getting better all the time. I was really proud of our bigs tonight. To hold them to 34 points is a good night. They can score and hurt you from outside." 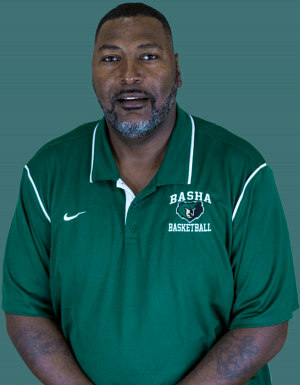 Brown led Basha (14-2 overall, 7-0 power-ranking games) with 15 points on 6-of-8 shooting from the field. Two of his three, 3-pointers (all in the second quarter helped the Bears to a modest lead. Brown's third trey in the quarter occurred just ahead of the halftime buzzer to put Basha up 23-18. 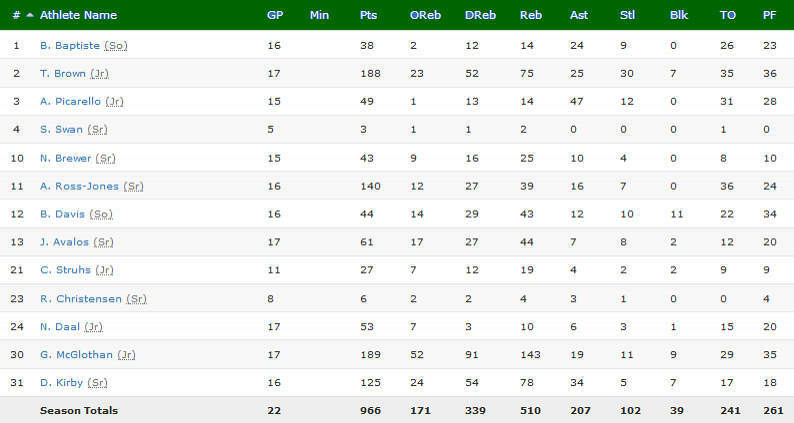 Other than those three baskets, all of Basha's scoring in the opening half came on layups or the offensive glass. McGlothan added 11 points and Kirby chipped in with nine. "Our zone did a good job defending the first shot, but they got too many second, third and fourths," Red Mountain coach Todd Fazio said. "We didn't shoot well and that hurt. We got too stubborn at times doing things that weren't helping us. "They have a deep team. 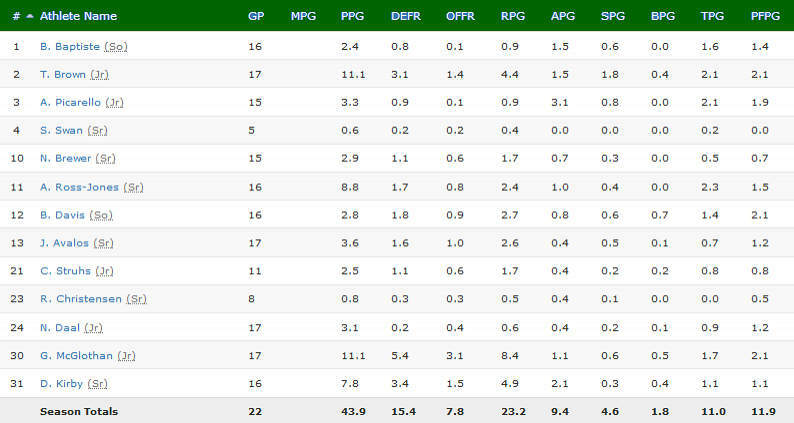 When you bring a D-I player off the bench (Kirby), that tells you something. Right now, Basha is one of the standards in the division." Red Mountain (8-7, 3-4 prg) forced nine turnovers in the first half and committed just two, but Basha's dominance on the offensive boards negated that edge. And Red Mountain did not shoot well other than the first 4-5 minutes. For the game Red Mountain made 12 of 43 shots (28 percent) while Basha was 22 of 38 (58 percent). Andres Mayberry led Red Mountain with 11 points (nine in the first half). Desi Ethridge tossed in eight, but on 3-of-10 shooting as Basha's interior defense thwarted his ability to create in the paint. Basha continued its unbeaten ways Tuesday night and did so in what has been typical fashion thus far. The Bears used their early-season experience in tight games to post a 69-63 victory over Mesa Mountain View in a Division I game at Basha. 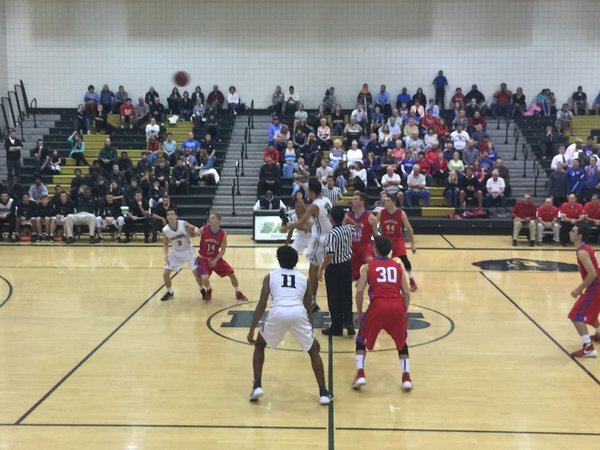 "I told our guys going against a program like Mountain View and Coach (Gary) Ernst) it would take 32 minutes,," Basha coach Mike Grothaus said. "Twenty-eight minutes, 29 won't get it. We played hard the whole way. The thing I like about us is how gritty and competitive we are. We didn't get rattled or lose our composure down the stretch." Basha took Grothaus' words to heart from the opening tip, breaking out to a 19-4 lead after the first eight minutes. A combined three 3s in the quarter from Kirby and Ross-Jones served to create a 8-0 run to begin the quarter and forced Ernst to resort to two timeouts to try to slow the Bears. Mountain View's 1-for-13 shooting effort from the field in the quarter didn't help matters. But as Grothaus expected, Mountain View didn't fade away. The Toros pulled within four in the second period (23-19) as their offense revolved almost exclusively from senior guard Tommy Kuhse and senior forward Zane Zowaiszas. They combined for 16 of Mountain View's 19 points in the first half that ended with Basha up 27-19. Kuhse led Mountain View with 18 points, Zowaiszas added 13 and Jayton Brown 11 -- all in the second half. Kuhse scored six points in the third period and got assistance from four teammates in the quarter as the Toros shaved the deficit to 44-41 heading to the final period. Basha managed a 50-45 lead with 5:09 left, but over the next 2 1/2 minutes committed four turnovers and scored just two points. Mountain View's 9-2 run in that interval landed it the lead, 54-52, on a 3-point shot by Matt Clark with 2:35 left. But Basha turned the tables using an 8-0 burst (six free throws and a steal and layup by Terrell Brown) to go back in front, 60-54, with 1:26 to go. Basha was perfect from the line in the final 2:29 to take and maintain the lead to the finish. "It's hard to win when you fall behind as much as we did early," Ernst said. "We did a good job battling back, but didn't play well the last couple minutes. We had some missed opportunities, and against a good team you can't afford that." Three of Basha's first seven wins were by four points or less and Grothaus felt those experiences were helpful in outlasting Mountain View. "We've been in close games already a few times and so far we've responded well in those," Grothaus said. 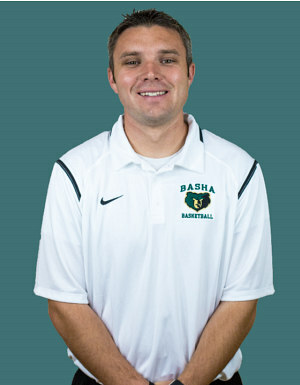 Varsity Head Coach Coach Grothaus enters his third season as the head basketball coach of the Basha Bears. 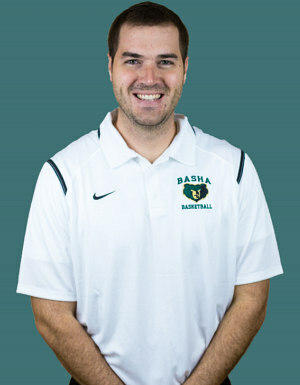 Prior to coming to Basha Coach Grothaus was the top assistant coach for Sam Ballard and the Thunderbirds of Mesa Community College. In his 5 years there he was responsible for recruiting, scouting, game preparation, practice planning and strength and conditioning. During the 2009-10 season the Thunderbirds held an overall record of 25-7 and 19-3 in the ACCAC. They were crowned Region I champs and would eventually fall to College of Eastern Utah in the District I Championship. This is Coach McCabe's second year being a member of Coach Grothaus staff and he couldn't be more excited to be here. Coach McCabe has known Coach Grothaus for nearly 20 years. Coach McCabe and Coach Grothaus grew up playing for all of the same coaches and feel they have a mutual vision for the principles and system they teach. Coach McCabe currently works for an Investment company and is grateful his schedule allows him to be a part of this program. Coach McCabe recently celebrated his 5th wedding anniversary with his wife Alexis and they are both very excited to be a part of Basha Nation. 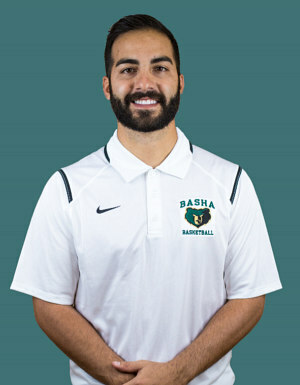 Varsity Assistant This is Coach Schiche’s first year as a member of Coach Grothaus’ staff. He is excited to be a part of the staff and contribute in any way he can. He originally grew up in Wyoming playing basketball, football, and soccer all 4 years of high school. He attended the University of Wyoming and is currently a US/AZ History and Government teacher at Basha. Coach Schiche was recently married to his wife Haylee in May of 2015.